We were out of town for race #6, so no race results. 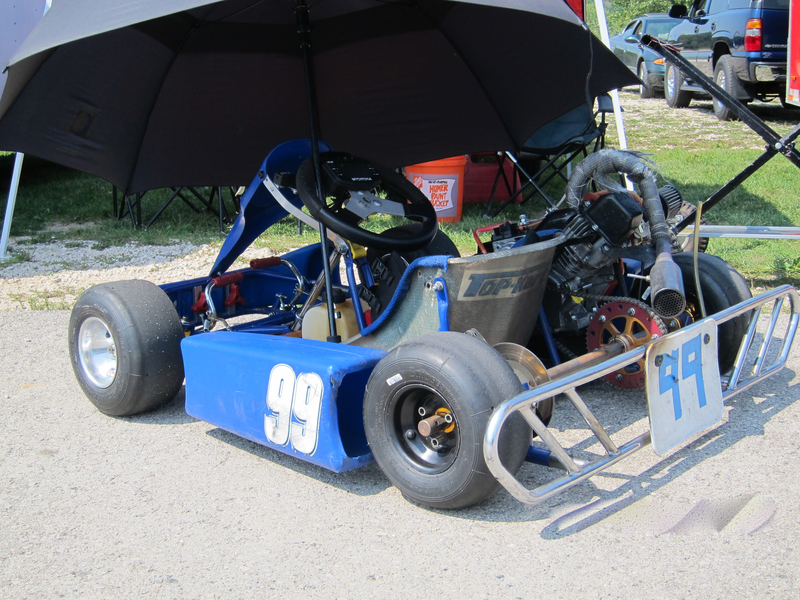 This past weekend was to be a double header, race #7 at Road America on Saturday and a Badger race on Sunday. Saturday’s plan was to work on finding a faster line and hopefully a win. On Sunday we just wanted to have fun racing and look at a kart for next year. This was expected to be another fun weekend of racing and hanging out with the boy. Every race at Road America starts with three 10 minute practice sessions for each class. There is no official start and the checkered flag is waved to let folks know it is time to get off. Our first practice session was the usual, run a bunch of laps and see how the kart is working. Unlike the previous race Jason was not alone; Bryce (#14) joined him after a few laps. The beacon is not out until the second practice so this is really just a warm up. For the second practice session I took a new approach, hoping Jason might understand the line from a new perspective. I wanted him to watch practice from the infield in order to see how the other drivers ran. This ticked him off something fierce. He is all about learning to drive while driving, not standing around watching. He is still resistent to me giving him pointers after a run or when we watch videos. Thankfully, once he was out there he got into watching Bryce and Easton (#4) go at it. We talked about how they run different lines and who was making better time and why that might be. At the end he was cheering for them both. For the final practice session he made some improvements but was still running behind the other two. I was worried that this might turn out to be another day of frustration. In the first heat, Jason started in the back and stayed there. He was not able to get by Easton let alone catch up to Bryce. I was worried that the kart might still be off. Jason was very upset at the end of the heat. His times were in the 30’s which is pretty good but he would need to step it up if he was going to actually race these guys. For the second heat he started on the pole and was able to pull to the front on the green. Unfortunately, after the first lap Bryce passed him and that is where they stayed. His line was still not optimal and he was loosing too much speed coming down the side of the hat and into the last corner. Before the feature Jason was waiting in the office where they have AC to keep the track workers cool. On one of the tables was an arial picture of the track and I had him try to run his line with his finger. Then he saw the back tire marks and all the bells started ringing is his head. “Oh, I need to follow the black marks ‘cuz that is where the line is”. This was great! He had figured out how to read a track! He again started on the poll, and on the green he pulled to the lead and made it stick. After a few laps Easton’s grandfather asked me, “What did you do, put ice in his pants?” Jason was now flying, I could hear that he was not letting up on the gas now. He had changed his line almost everywhere and was able to keep Bryce at bay. Out of the last corner Bryce made one really hard run at Jason as they took the white flag. Jason keep hauling for the last lap and took the checkered flag. When we looked at his times all but a couple of laps where in the mid 29s. This is real improvement. Above is a video montage of the feature race, that includes the start and the finish. I really like the section in the middle where you can really see them zip around the corners. After packing up the truck and wishing our friends a good night and thanks we drove to Delafield, WI. There we ordered victory pizza in the hotel room and watched bad action movies. A perfect ending to a great day. The next morning brought rain and no races. This was disappointing. However, we had a second goal while we where there, which was to look at a kart for next year. After a bit of hemming and hawing, and having a skeptical friend look at the kart, we purchased a Coyote Kryptonite with a blueprinted Briggs Animal and a new white M&M body. This was pretty exiting. It won’t be finished for a week or two and then it will still be a few more weeks after that before we will be able to try it out and starting working on next year. We need to wait until Kid Kart racing is done so he stay focused for the last bunch of races. The next race is September 9th at Badger. Check out the schedule page for all our race dates. 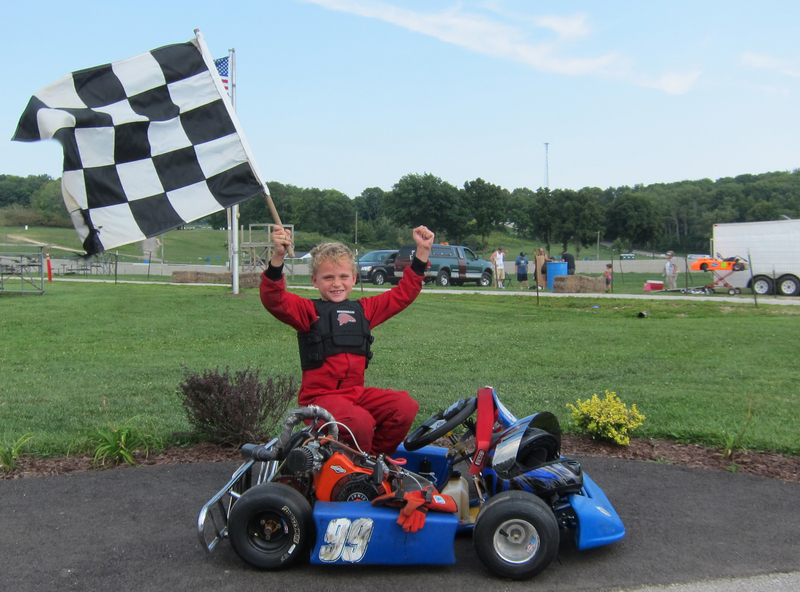 Thanks for the week go to Brian Julian, Regan Vehring at 4cyclecentral, the track crew at RA and as always my lovely wife for letting her little boy go “Scary Fast“.